IOHRD stunned and condemns all forms of imprisonment, detention, and prosecution of the human rights defenders and activists the last few months in Iraq ending with the convection of the Iraqi human rights defender, Basim kashaan. It is very clear that the main purpose of these conventions is to silence the free voice of the civil society that is represented by the defenders who have a national mission to monitor, document, and stand against corruption and violations; these defenders follow all legal and civil path in their fight. IOHRD noticed very hostile steps that have been taken by the Iraqi executive, monitoring, and judicial institutions against human rights activists and defenders. This seems very embarrassing and stressful to those governmental institutions to call them for real reforms and true fight against corruption and spoilers. Human rights activists’ reform requests came along with the Iraqi prime minister reform campaign, which make it very strange to target these defenders because of calling for the same reforms! 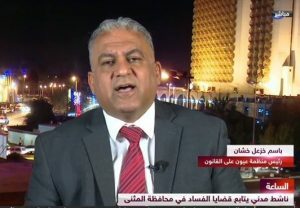 The current targeting campaigns reached the Iraqi human rights defender, Basim kashaan, who is a well-known of his extraordinary efforts in AL Mothanna City to stand against the corruption and the spoilers. He followed all the legal and democratic ways in his fight by resorting to the Iraqi courts and public prosecution service to chase any suspicious corruption activities. However, the Iraqi institutions, in their efforts to scare and silence the activists, filed false complaints using the criminal law to prosecute these activists for unclear and unreal crimes that they did not committed such as (crime of publications, crime of justice mislead, fals news, libel and insult, defamation). Unfortunately, those activists have been convicted and sentenced for six or seven years in prison, which is very unfair and crue. This indicates that the judicial system in Iraq supports the targeting campaign against the human rights defenders and activists in Iraq. IOHRD believes these convection statements mean that the spoilers achieved their goals to terrorise the activists and defenders. All subsequent judicial convection cancellation decisions do not mean anything only close the international disapproval and condemnation file against the civil society defenders and activists targeting policy; the judicial system in Iraq does not absolve its responsibility to protect civil society defenders and activists. IOHRD believes that these procedures, prosecution, and conviction statements constitute violations of the Iraqi citizens’ constitutional rights. In addition, they violate the Iraqi defenders and activists freedom of expression and fair trial rights. IOHRD would like to remind Iraqi government, include its three branches, of its legal responsibility toward its citizens including the civil society defenders and activists at the national and international obligations levels. Cancel all convection statements against the defender Basim Kashaan and release him immediately. Review all effective legislations in purpose of not criminalize the freedom of expression or narrow its scope to be consistent with Iraq international obligation in regards to the freedom of expression, especially article (19) of the International Convention of the Civil and Political Rights. To prevent, during the transitional period, Iraqi judicial authority from applying the effective provisions and prosecute the individuals for their peaceful expression of their opinions. Based on a judicial suspension decision of the Iraqi federal court, considers any convection of this kind as a constitutional violation and violation of Iraq international obligations. The Iraqi parliament must cancel all laws and legislations that conflict with the international norms that protect the freedom of expression. Or the constitutional court must decide to conform these laws with the constitution protection. Promote the freedom of expression respect culture in the public discussion for the public figures and do not criminalize their activities. Collaborate with the civil society to stop any violation and stand against corruption.